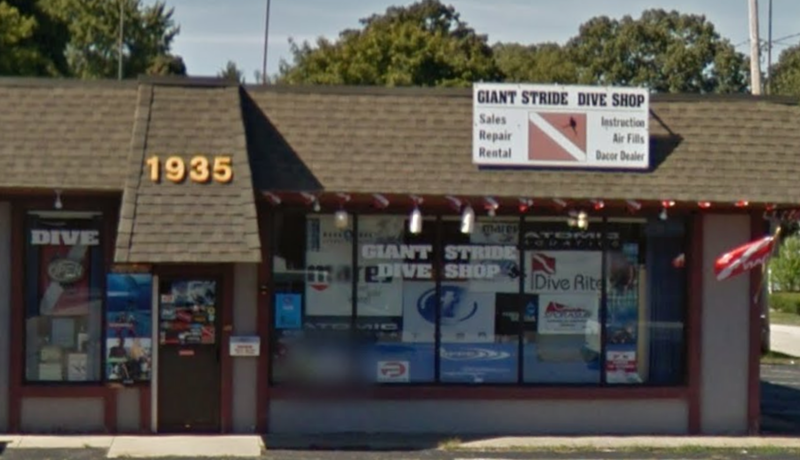 Welcome to Giant Stride Dive Shop! Serving local New England Divers with friendly, knowledgable, and professional service. We sell air that is triple filtered and tested quarterly with results posted in plain view so you can verify them yourself. Custom Nitrox and Trimix blends are available as well as Argon for your drysuit. We pride ourselves on having the largest selection of inventory in RI from backplates & harnesses to snorkel sets and spearguns. Please consult our Products page for brands and manufacturers carried in our inventory. Our Dive Travel Department will provide you with the best trips at the most economical prices available. Local charters are run at least once a month (in season) to wrecks and other aquatic points of interest. The service department is equipped with a Peterbuilt Flowbench and a Seat Setter (break-in machine). We repair drysuits and replace latex seals with a turn-around time of less than a week in most cases. Our Instructors are from various agencies such as PADI, NAUI, TDI, & DAN etc. and are eager to share their expertise with students interested in learning how to scuba dive. We offer certifications from Open Water Diver through Instructor level with Nitrox, Advanced Nitrox, Decompression Procedures, Extended Range/Trimix being just a few of the many specialties offered.